After teasing with a demo earlier this month at the Dell EMC World conference, Toshiba is now officially announcing their first SSD based on their 64-layer BiCS3 3D NAND. This is the first generation of Toshiba 3D NAND that will be adopted across their entire range of SSDs, and the first product to get the new flash is a consumer-oriented M.2 NVMe SSD. The Toshiba XG5 is the direct successor to the XG3 and will occupy the highest of Toshiba's three tiers of client OEM SSDs. While the XG3 and its retail sibling the OCZ RD400 used planar MLC NAND, the XG5 uses 3D TLC NAND but still promises higher throughput. The Toshiba XG4 was the TLC-based counterpart to the XG3, and its role as the entry-level NVMe drive will be taken over by the BG-series NVMe BGA SSDs, while SATA SSDs will continue to be the lowest tier of Toshiba OEM SSDs. 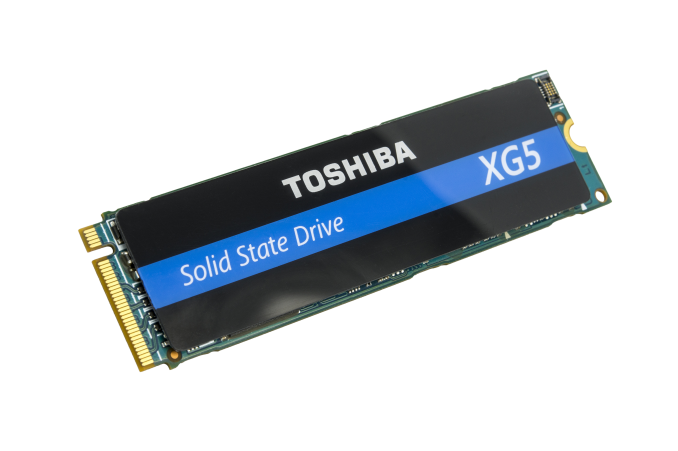 It's unusual for Toshiba to put out a press release about a client OEM SSD, but the XG5 is a major milestone for the company as they finally begin a widespread transition to 3D NAND. The preceding 48-layer BiCS2 3D NAND did technically ship, but only in a handful of niche products, while BiCS3 is planned to replace Toshiba's planar NAND in all mainstream applications. The XG5 is currently sampling to all the usual OEMs for qualification in their upcoming products, and systems using the XG5 should be on the shelves in the second half of this year. Aside from the use of BiCS3 3D NAND, Toshiba isn't sharing much in the way of technical details about the XG5. Sequential reads are rated for 3GB/s and sequential writes at 2.1GB/s, but random access performance has not been disclosed other than to say it's better than the XG3. Typical power consumption is rated at 4.6W for reads and 3.5W for writes, with idle of less than 3 mW. Toshiba won't confirm if the controller has been upgraded from the XG3/RD400 controller, but at the very least the firmware has been significantly updated. There will be XG5 models both with and without TCG Opal encryption. The XG5 will be available in capacities from 256GB to 1TB. The smaller capacities will be using Toshiba's 256Gb TLC BiCS3 dies and the larger drives will be using the 512Gb TLC parts. The 512Gb TLC could easily enable capacities above 1TB, but the OEM market currently isn't interested. When Toshiba releases a retail counterpart to the XG5 it is very likely we'll see a 2TB option in addition to the firmware tweaks and custom NVMe driver the OCZ RD400 came with. Practically all TLC drives (including 3D TLC ones) use a SLC cache anyways.